Have you ever wished there were more hours in the day to help you get everything done? With events to run, payments to record, and a member database to manage, it can feel like you need to spend all day at your desk to work through all your tasks. Although we can’t help you time travel (sorry! ), the Wild Apricot for Admins App can help you reclaim valuable time when you’re on the go. Our handy app helps you check tasks off your list even when you’re away from your computer, by bringing a simplified version of some of the most-used Wild Apricot features to your mobile device. Whether you’re travelling, multitasking, or working from home, you can always have Wild Apricot in your back pocket. 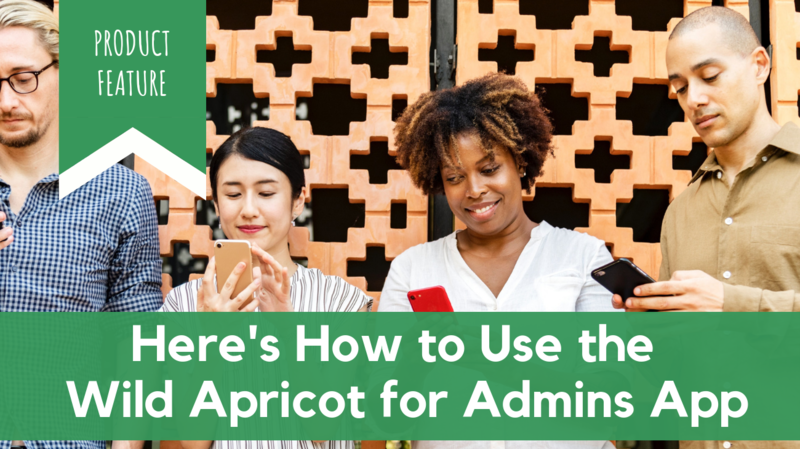 If you haven’t tried the Wild Apricot for Admins App yet and want to get started, or if you have the app but aren’t sure how to get the most out of it, read on — this post is for you! There are two Wild Apricot apps that you can download: the Wild Apricot for Admins App and the Wild Apricot for Members App. 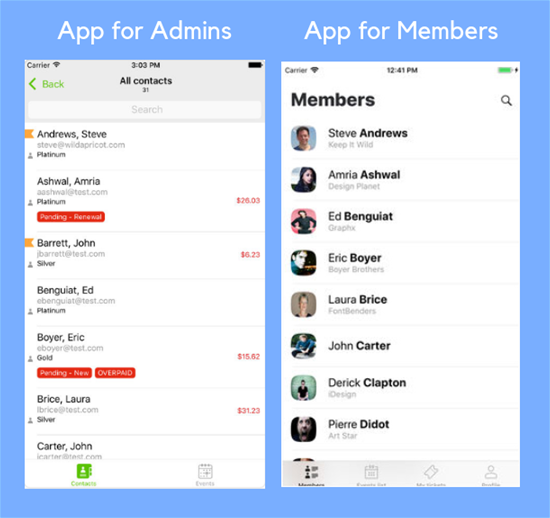 With the app for admins, account administrators can manage tasks like updating events and accepting payments from members. Using the app for members, your constituents can view and sign up for events, view their profile and membership card, and view your member directory. This article will give you some ideas for ways our admin app for associations, nonprofits and membership organizations can make your life easier, as well as walking you through step-by-step instructions on how to complete common tasks. There are three modules within the Wild Apricot for Admins App: Members, Events, and Emails. Below, I’ve listed some tasks that often come up when you’re holding an event (whether it’s a fundraiser, an organized hike, a yoga class or a networking session), and how the Wild Apricot for Admins App could help you handle these challenges with just a few clicks. For these steps and the screenshots I include, I’ll be using an Android phone, but you can also use a device with iOS. If you’d like to skip ahead to a particular section, just click the link above. - Open the Wild Apricot app by tapping the icon on your phone’s home screen. - Swipe to the right to bring up the side menu, and select the Emails module. - Select whether to view Drafts, Scheduled or Sent emails by tapping the tabs at the top. - A list of your emails will be shown, including the date, the number of people it was sent to, and the percentage of the emails that were successfully delivered or failed. - Tap on the email you would like to view — you will be able to see the contents of the email in the app. - In the Events module, select the relevant event from the list. - Tap the three dots icon in the top right corner of the event page. - Select Edit from the pop up menu that appears. - Tap the check mark icon in the top left corner to save the changes. - In the Events module on the app, select the relevant event from the list. - Select the Registrants tab from the top of the page. - Use the search box to find the person’s name from the list. - Tap the button to the left of their name to sign the registrant in — this will show as a check mark when the check in is successful. - If the registrant’s payment is outstanding, the amount payable will be shown to the right of their name. A message will pop up when you check the registrant in to remind you that the registration payment is outstanding. - Select either Check in without payment or Check in with payment. If you choose Check in with payment, you will be brought to a screen where you can record the payment details. - Go to the Contacts module in the app. - Tap the magnifying glass icon in the top right corner to bring up the search bar, and search for the contact you want to edit. - Select the contact from the search results. - In the profile tab, tap the pencil icon in the top right corner to open edit mode. - Tap the check mark icon in the top left corner to save your changes. - Select the Finance tab. - Here, you can see any outstanding payments that are due. Find the invoice you are taking payment for in the list, and tap Pay to the right of the invoice number to proceed to the payment screen. - If you’re using iOS, you can now also choose to receive credit card payments via Wild Apricot Payments directly from your app — find out more here. - Tap the + icon in the bottom right. - Fill in the details for the new contact. - Tap the check mark icon in the top left of the screen to save your new contact. - Follow the instructions for creating a new contact. - Under the Membership heading, click Level. - From the pop-up menu that appears, select the relevant membership level. - Tap the check mark icon in the top left to save your choice of membership level and return to the New contact screen. - Tap the check mark icon in the top left of the New contact screen to save your new member. The Wild Apricot for Admins App for associations, nonprofits and membership organizations is available to download on iOS or Android smartphones. To log in, you’ll need to be registered as an admin for a Wild Apricot account. The Wild Apricot for Admins App is available to all paid or trial accounts — it is not available to free accounts at this time. Are changes made in the mobile app also made on your website and in the browser application? Yes — any changes you make in the mobile app will be automatically updated in the browser application, and likewise any changes in the browser application will update to the mobile app. Can you send emails directly from the app? Go to the Drafts tab in the Emails module. Select the draft you would like to send from the list. When you’re ready to send, tap the arrow icon in the top right corner. A pop up message will ask you if you’re sure you want to send — tap OK to send the message. As with all our software, we’re constantly developing and updating the apps to suit our customers based on your feedback in the Wishlist Forum. As well as seeing which features we’re currently working on for the mobile apps, you can also add your own ideas to this list. So, why not download the app and let us know what we could do to improve your experience? For more detailed instructions on how to use these features, and for information on the complete range of features in the Wild Apricot for Admins App, visit our Help Site pages on the mobile apps. If you have any questions, or need help using the app, feel free to contact our support team.